How can you describe it? Where is it? How many classrooms are there? What do they look like? What facilities does your school have (a computer room, sports field, etc)? How about the students? Is it a mixed school, or boys- or girls-only? How old are they? What are the teachers like? What do they do? What lessons do you have? Which are your favourite and why? Do you have to wear a uniform? What does it look like? What rules does your school have? What happens if you break them? How about after school activities? What are they? Think about your front page. It should be interesting and informative. It should be nicely designed too. You can look at some other school websites to get some ideas. Search on Google for some schools you know and look at their websites. Look in your Challenges 3 book at the schools we talked about in Module One. Remember, it must be at least 2 minutes long! Afterwards we will choose the best presentation and then do our self-assessments! Task: to produce a guide to a city or district that you are familiar with. + Original photos (photos that you took; at least two)! + Two lies (pieces of false information)!! + Brochures must not feature Ocean Park or Disneyland!!! 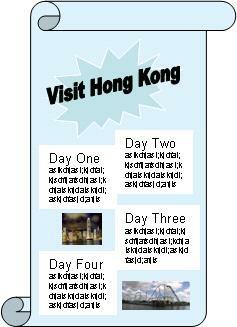 Task: To plan a four day tour of Hong Kong and design a poster advertising it. * Dates, Times, Places, Prices, Transport options and other details for sights, places of interest and attractions. * Language that makes the reader interested, excited and curious about the places. * Pictures and attractive design.